Perez Prado : Big band charts from the Perez Prado Orchestra. A range of big band arrangements made famous by Perez Prado and his orchestra. Dámaso Pérez Prado was a Cuban band leader, organist, pianist and composer who became known as "King of the Mambo". 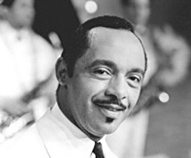 Although a native of Cuba, he moved to Mexico in 1949, formed his own band and signed with RCA Victor. He quickly rose to prominence, helped in part by Sonny Burke's reworking and subsequent release of "Qué rico el mambo" as "Mambo Jambo". and toured extensively in the United States. Perez Prado's style differed from earlier Mambo concepts. It was written for a bigger, brassier orchestra and featured catchy musical counterpoint between reeds and brass, plus Prado's now famous grunts that he injected into many of his recordings. Which famous charts might you know? Prado's best known charts include "Guaglione", "Mambo Jambo", "Patricia", "Cerezo Rosa" - also known as "Cherry Pink and Apple Blossom White" - and "La Cucaracha".